As a parent, it is natural to want what is best for your child. But, while most parents spend countless hours helping with homework, discussing career options and fostering their child’s interests, the financial health of their child can often get neglected. 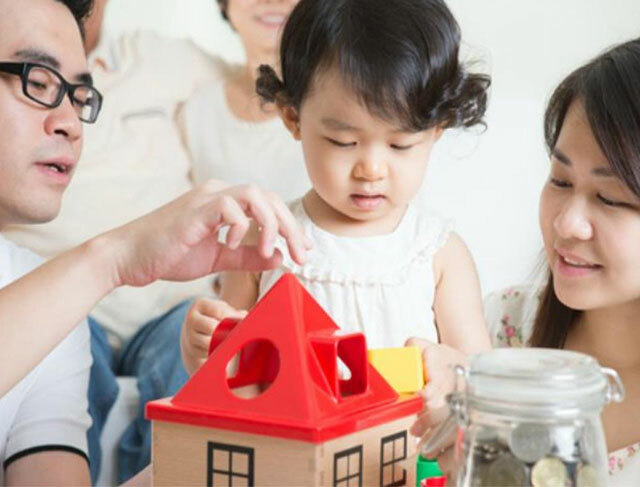 There are many ways parents can set their kids on track to financial freedom – both from a young age and at the time of their first property purchase. Graham Turnbull from Zinger Finance shares some practical tips below. You often hear a lot about “planting the seed” when it comes to good parenting. Educating kids about money is no exception. Teaching them how to create and stick with a savings pattern from an early age can help them grow wealth as they get older. Most people tend to spend their income on expenses and then save whatever is left. However, early income earners should save as much as they can before spending the remainder. Should pocket money be deposit money? Instead of paying your child pocket money when they do their chores, why not pay them money towards a property deposit instead? This may help them see the value of their earnings and prevent them from spending it on junk. By encouraging them to find ways to earn and save while they are studying, you are helping to foster a can-do attitude and an appreciation of what it takes to get ahead. Becoming an adult – it’s not a walk in the park. Creating an awareness of the financial struggle that many adults go through can also help your child develop a sense of respect towards money. If they know that some hard work now when they are young will pay off down the track when they are in their prime, they will be able to make a conscious decision to set themselves up for the future. Helping fund their first property purchase. There are a lot of restrictions in the world of lending at the moment. Banks need to carefully consider whether clients can pay back their loans before they can issue finance. They also need to consider whether the client has enough of a buffer to cope with rate rises and changes in the market. For young people, having a high enough income to service strict lending requirements – as well as a buffer and a deposit – can be quite a challenge. In this kind of environment, income is absolutely crucial and savings are very important. But, if the income of the child is not quite enough in the eyes of the bank, there are a few ways that parents can help. The most ideal way that parents can help is to lend some money towards the deposit. If the child can put in more cash, they won’t need as big a loan. If the parent isn’t able to lend money, becoming a guarantor may help the child’s chance at being approved for a loan. There are two ways of doing this. Either the parent agrees to guarantee a fixed percentage of the property value, or they sign an unlimited guarantee. In the latter option, the parent would be liable to pay off the entire loan amount should the child be unable to. It is essential for parents to seek legal advice before agreeing to become a loan guarantor. Parents must know what they are getting into as they will have to sign the loan contract. They will be involved in the transaction as well as any changes to the arrangement later on. Parents should also make sure their kids aren’t buying a poor investment or overspending on the property. The child needs to understand clearly what they are getting into and the parent needs to support that and involve themselves in the discussion. If the above two options aren’t possible, the parent may put up their property as a guarantee to the loan by cross securitising it with the child’s. This the least advisable option to take and parents should only consider this if the first two options aren’t viable. In this kind of scenario, if the child can’t pay back their loan, the parent may lose their property to the bank. Saving for them when they are babies. If you have just started a family, why not put aside some savings into a high interest earning account when your baby turns one. When they are 18, you can give them the money as a gift to use towards their first property deposit. This is a manageable way to save the money as well as a really nice gift idea. The best way to help your kids with their financial future is to lead by example. If they grow up watching you make sound financial choices, it is likely they will have a better understanding of how to achieve this themselves. If you don’t know where to start with your own journey, it is never too late to learn. Involve your kids by sharing your experiences with them so they will have a head start.